To be Seen in a Commodious Pavilion in this Place. The Performing Pig & the Mermaid? If not, pray do! as the exhibition contains more variety than any other in England. Those ladies and gentlemen who may be pleased to honour it with a visit will be truly gratified. The Swinish Philosopher, and Ladies' Fortune Teller. That beautiful animal appears to be endowed with the natural sense of the human being. He is in colour the most beautiful of his race; in symmetry the most perfect; in temper the most docile; and far exceeds any thing yet seen for his intelligent performances. He is beyond all conception: he has a perfect knowledge of the alphabet, understands arithmetic, and will spell and cast accounts, tell the points of the globe, the dice-box, the hour by any person's watch, &c.
or copy, but the same curiosity. The great "prodigies" of this show were the "performing pig," and the performing show-woman. She drew forth the learning of the "swinish philosopher" admirably. He told his letters, and "got into spelling" with his nose; and could do a sum of two figures "in addition." Then, at her desire, he routed out those of the company who were in love, or addicted to indulgence; and peremptorily grunted, that a "round, fat, oily"-faced personage at my elbow, "loved good eating, and a pipe, and a jug of good ale, better than the sight of the Living Skeleton!" The beautiful dolphin was a fish-skin stuffed. 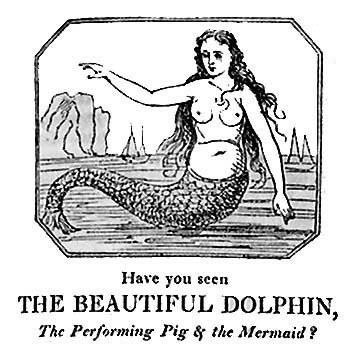 The mermaid was the last manufactured imposture of that name, exhibited for half-a-crown in Piccadilly, about a year before. The real head of Mahowra, the cannibal chief, was a skull that might have been some English clodpole's, with a dried skin over it, and bewigged; but it looked sufficiently terrific, when the lady show-woman put the candle in at the neck, and the flame illuminated the yellow integument over the holes where eyes, nose, and a tongue had been. There was enough for "a penny!"